Norwegian's approach to dining is to give passengers lots of choice -- there are 11 dinner venues plus a sushi bar and room service -- but to charge extra for meals in more than half the restaurants. Passengers can eat for free in two main dining venues, the buffet, O'Sheehan's pub and Bamboo, the Asian restaurant. Extra-fee options range from Benihana-style Teppanyaki to steaks, Mexican and classic French bistro fare. You could manage to try every restaurant on a seven-night cruise, but it would get costly. Even so, the variety of dinner options keeps meals fresh and fun, as you're not going back to the same restaurant every evening (unless you want to). Overall, we found the food to be flavorful and well prepared, and service was excellent throughout. 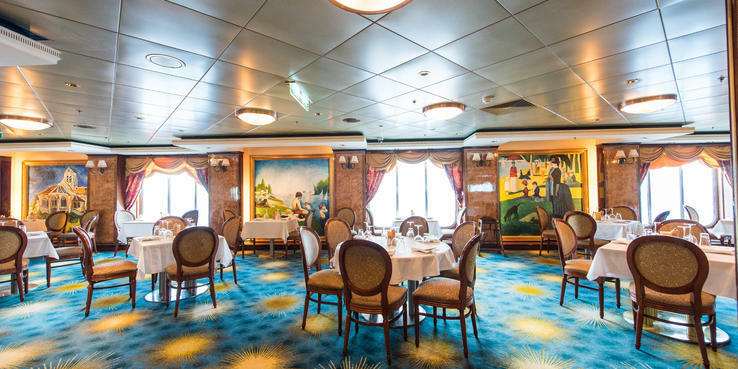 If you sailed Norwegian in previous years, know that the menus changed after the 2016 dry-dock, just because you loved or disliked a restaurant on cruises past does not mean you'll have the same experience now. The staff were accommodating of special diets, but you get better results if you pre-order your meal the night before. Menus are posted outside of each restaurant (or you can ask to see specialty restaurant menus at the Reservations desk at Guest Services), which was helpful in deciding which nights to eat at the main dining rooms and which to seek out an alternative. You can make reservations for specialty restaurants and main dining rooms at the Reservations Desk on Deck 7 (just to the side of reception), at each restaurant, through the iConcierge app or your cabin TV, or by calling the reservations number from your phone. You can also make reservations online in advance of your cruise, but not all dining slots are available, especially for odd-numbered and large groups. During dining hours, which start at 5:30 p.m. (last reservations are 10 p.m.), electronic signs in public areas show which venues have no, short or long waits for walk-ins. Tip: The specialty restaurants are much less busy the first couple of days of the cruise when most passengers are still orienting themselves. Kids' menus are available in all restaurants, and have a standard selection of chicken tenders, pizza, hamburgers, mac-n-cheese and peanut butter and jelly sandwiches. Children can order off the regular kids' menu for free in any upcharge restaurant, or they can order off that restaurant's regular menu for the listed price. Venetian and Aqua (Deck 6): The ship's two "main" restaurants, both on Deck 6, differ mostly in terms of atmosphere; their menus are identical. The 433-seat Venetian is the more cruiselike of the two, though smaller than most main dining rooms on mainstream cruise ships and feels less crowded. With white walls, high ceilings and floor-to-ceiling windows that stretch across the entire back wall, the venue is light and airy -- though it does feature bizarre renditions of portrait paintings with slashes of colored paint across the faces and bodies. Because the Venetian is situated on the stern, its location is also one of the most motion-sensitive of the entire ship, so if you're having a rocky sea day, you might want to dine in one of the midship eateries. The 340-seat Aqua features a contemporary decor with touches of blue, and is also dimly lit, which can make for a more romantic dinner. In both venues, tables are available for two, four and larger groups. Both of these dining rooms are open for dinner daily from 5:30 p.m. to 9:30 or 10 p.m., while the Venetian also serves breakfast and lunch. Kids menus are available for breakfast and lunch/dinner, and come with crayons to keep the munchkins busy. The breakfast menu offers fruit, yogurt, cereal, eggs and omelets, bakery selections (order them -- waiters don't come around with baskets), pancakes, waffles, French toast and sides like bacon, sausage and hash browns. An Express Breakfast of scrambled eggs, potatoes and baked beans will get you in and out faster; daily changing specials might include vanilla pound cake French toast or huevos rancheros. Lunch starts with appetizers like roasted tomato soup, spinach Caesar salad or chicken nachos. Choose from sandwiches and burgers (tuna salad, Philly cheesesteak) or entrees like fish and chips, Spanish frittata or fried chicken. If you can fit in dessert midday, options might be peanut butter cup cheesecake, Key lime parfait or ice cream. The dinner menu is divided into two sections. The first page has a changing selection of appetizers (beef carpaccio, New England clam chowder, Caesar salad) and entrees (braised red snapper, lamb tikka, beef tenderloin, baked eggplant). There's always a fish and vegetarian option. The second page is always-available choices, either complimentary (steak frites, herb-crusted chicken, flounder Milanese, shrimp rigatoni) or extra-free (ribeye for $19.99, surf and turf or a whole Maine lobster for $24.99). Desserts always include a cheese or fruit plate, ice cream and a warm chocolate lava cake; changing selections might be pistachio creme brulee, cheesecake or cherries jubilee. Bamboo (Deck 7): Bamboo is the ship's Chinese restaurant. The menu features appetizers (pot stickers and spring rolls), soups (hot and sour, egg drop), mains (kung pao chicken, vegetarian fried rice, beef chow fun) and desserts (coconut tapioca pudding, crispy chestnut and red bean triangles, five spice chocolate cake). Two premium entrees incur a charge: lobster Cantonese ($24.99) and ginger-steamed Chilean sea bass ($15.99). You can also order sushi at a la carte prices. The complimentary menu is rather limited (it's shorter than it was when the restaurant incurred a surcharge), and it's not a stellar choice for folks with various dietary restrictions. O'Sheehan's Neighborhood Bar & Grill (Deck 8): O'Sheehan's is a pub, sports bar and casual restaurant in one, with a prime location overlooking the main atrium action. It's an open space surrounding the atrium, rather than a walled-off venue, which gives it a direct view of the elevated stage where musicians perform, as well as activities going on in the Java Cafe or Deck 7 plaza. This means that people actually use the bar to drop by for a late-night snack or dessert, as well as dine here for breakfast, lunch and dinner. The menu is all comfort food and pub fare -- fish and chips, fajitas, burgers, bangers and mash, Buffalo wings and spinach-artichoke dip. Breakfast includes baked goods, eggs and omelets, French toast, oatmeal and corned beef hash. Desserts tempt with apple pie a la mode and brownie cheesecake. O'Sheehan's is a great option for a laid-back dinner without a price tag, without having to go to the buffet. Open 24 hours. Garden Cafe (Deck 12): The buffet area is open from early until late and popular at all times of day. Be aware that the port and starboard stations do not offer the same dishes, so you'll need to make the full circuit to peruse all the options. The soft serve ice cream dispenser is hidden all the way aft, beyond a buffet area that we never saw in use. Beverage stations are always open and form a wall between the seating area and the food service area. The Garden Cafe serves early-riser breakfast from 5:30 a.m. and regular breakfast from 7 to 11:30 a.m. It features standard breakfast options (omelets made to order, eggs, bacon, cereal, yogurt, breakfast pastries, fruit, pancakes and waffles). An easily overlooked juice bar sells fresh fruit and vegetable juices for $2.50 to $3.50. At lunchtime (11:30 a.m. to 3 p.m.), you'll find lots of international options, from Indian cuisine to made-to-order pasta and Asian stir-fry, as well as make-your-own and pre-made salad and sandwich stations, hot dishes, fruit and desserts. One oddity -- there isn't white or wheat sandwich bread (or peanut butter, or jam) in the sandwich area at lunch -- just meats, cheeses, tuna and egg salad and fancier rolls and breads. During dinner (5 to 9:30 p.m.), there are carving stations, made-to-order pasta and hot entrees, sometimes with a theme like Country Western night. In between lunch and dinner, and after-dinner until 11:30 p.m., you'll find a hearty snack selection. Late-night is lots of comfort food -- pizza, burgers and hot dogs, sandwiches, nachos, etc. The pool-deck extension of the Garden Cafe is called Topsiders. It's got a buffet line that's open noon to 5 p.m., serving burgers and hot dogs and a partial selection of the food available inside. In the middle is the Sprinkles ice cream counter, serving three flavors of complimentary hard ice cream (always chocolate, vanilla, strawberry) with toppings. La Cucina (Deck 6); a la carte: If you dismiss Italian venues on cruise ships as uninspired pasta joints, don't make that mistake on Norwegian Dawn. La Cucina was one of our favorites, and so popular that it swapped places with Le Bistro in the 2016 refurb to offer more tables. The venue is carved up into sections, so the dining experience feels more intimate. Cheat on your Paleo diet for the amazing, fresh warm bread that starts the meal. Starters include standards like caprese salad and fried calamari; pastas (served as sides or mains) include pesto gnocchi, meat or vegetable lasagna, and rigatoni with veal meatballs. For mains, choose from osso buco, pancetta-wrapped rack of lamb, lobster or filet mignon with a gorgonzola crust, among others. Authentic Italian desserts (like tiramisu) and aromatic espressos are offered for dessert. Le Bistro (Deck 6); a la carte: Le Bistro is positioned as a date-night venue; it's the only specialty restaurant with a dress code (no shorts). The venue features heavy French options like mushroom soup, escargot, and fish and beef dishes covered in sauces. The fare there is top-notch and served similarly to what you would expect at a nicer land restaurant. Desserts include vanilla creme brulee and chocolate fondue for two. Teppanyaki (Deck 7); $29.95: Part show, part meal, Teppanyaki is a Benihana-style restaurant in which diners sit around a hibachi grill, while chefs simultaneously prepare seafood, steaks and vegetables while telling jokes and tossing food in the air -- and catching it, of course. Teppanyaki can only seat 32 people per seating (eight per hibachi grill), so advance reservations are a must. Seatings are at 5:30, 7:15 and 9 p.m.
Sushi Bar (Deck 7); a la carte: The Sushi Bar is adjacent to Bamboo, and passengers can grab a seat at the bar and watch the chefs roll their sushi to order. Ten types of rolls are available, plus nigiri and sashimi upon request. Los Lobos (Deck 12); a la carte: Carved out of the aft section of the buffet, Los Lobos is styled after a Mexican cantina, with colorful skull masks on the wall and a menu featuring tableside guacamole, tacos and burritos and tequila-based drinks. Other than the wall art, the a la carte eatery feels more cruise-ship-restaurant than authentic-Mexican-hole-in-the-wall, but that doesn't take away from the truly yummy dishes. Regular and spicy chips accompany the made-to-order guac, the beet-and-watercress salad was simple but flavorful and mahi-mahi tacos quite tasty. One order of quesadillas is enough for two kids to have dinner, and the beignets are crispy and sweet, and enhanced by the guava sauce. It's hard to find -- we wandered lost around Deck 13 for a while, even after asking a Garden Cafe waiter for directions. It's literally a hidden gem. Cagney's Steakhouse (Deck 13); a la carte: Cagney's is a Morton's-like establishment, featuring Angus beef, lamb and seafood with sides like rice, mashed potatoes and creamed spinach. While the meat is cooked and seasoned well, the sides and appetizers are outstanding. The shrimp cocktail is a great size and features a tasty olive oil and herb marinade and cocktail sauce with a nice horseradish kick. Weeks later, I can't stop thinking about the white truffle fries. They only come with one entree, but the restaurant is happy to serve you up a batch as an appetizer or an additional side. You just have to ask. Cagney's also serves breakfast and lunch for select past-passengers and those booked in suites. Moderno Churrascaria (Deck 13); $24.95: Monderno Churrascaria, a Brazilian-style steakhouse, offers 11 different meats, including lamb chops, filet mignon, sausage and bacon-wrapped chicken breast. In addition the restaurant's all-you-can-eat salad bar includes international cheeses and dried meats, olives, and pickled and marinated veggies. If that isn't enough, you also get sides: white rice, sauteed mushrooms, garlic mashed potatoes and fried yucca. Dessert includes papaya cream and coconut flan. Room Service: There's 24-hour room service that carries a $7.95 convenience fee per order placed (excluding morning coffee and continental breakfast items). In the morning, order omelets, French toast, oatmeal and breakfast meats. All day, choose from hearty chicken soup, three different salads, BLT, pizza, burgers, fish and chips, grilled salmon, kids' meals and desserts. Soda, alcohol and special occasion platters (caviar, cheese plate, cold hors d'ouevres) require a per-item fee in addition to the delivery charge.